Plans are required to operate exactly in accordance with the provisions spelled out in the plan document. In this situation, the plan calls for withholding deferrals and calculating matching contributions based on gross compensation, including bonuses. Some plans specify that participants are required to make a separate deferral election with respect to bonuses and that, absent such an election, the default is not to withhold 401(k) contributions from bonus payments. We don’t have that type of language in this case, so deferrals should have been withheld. Since bonuses were not properly considered, the plan’s operation did not follow the document. As a result, an operational failure has occurred and a plan correction is required. 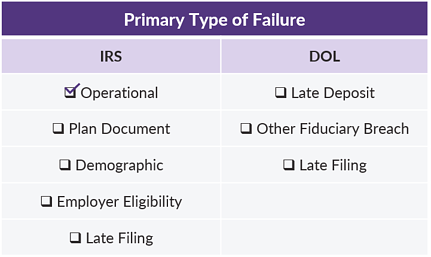 Failing to withhold deferrals from eligible plan compensation is considered an operational error referred to as a Missed Deferral Opportunity (MDO). Essentially, plan participants missed an opportunity to defer; in this case an opportunity to defer from their quarterly bonus. In the case of an MDO, the fix is relatively straightforward and involves 5 steps. Determine the amount the participant would have deferred had the error not occurred. This is the missed deferral opportunity (“MDO”). Calculate an employer Qualified Nonelective Contribution (“QNEC”) to compensate the participant for the MDO. Calculate any employer matching contribution associated with the MDO. Adjust items 2 and 3 for investment gains. Deposit the resulting amount into the participant’s plan account. Additional details about each of these steps is available here. Let’s apply the above correction methodology to the facts at hand. We calculate the missed deferral amount by simply multiplying each participants deferral election by the bonus amounts. We then apply the QNEC percentage to the missed deferral to arrive at the corrective QNEC due each participant. 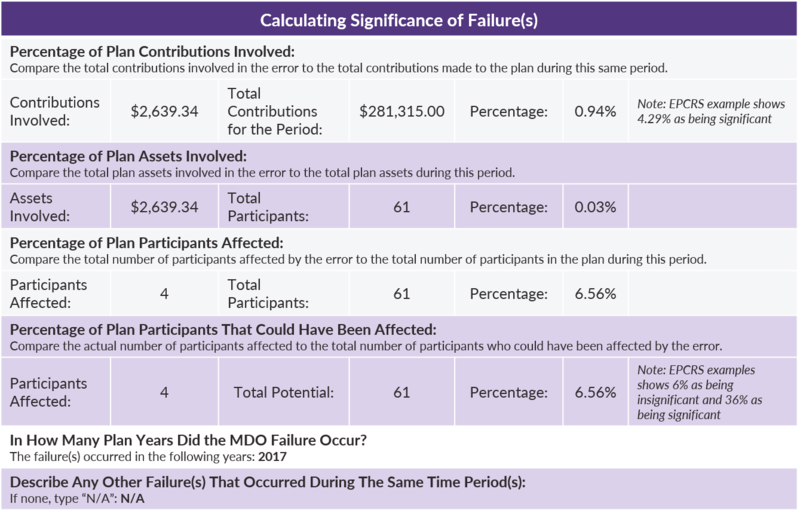 Note that because this error was caught and corrected within 2 years of discovery, the plan sponsor was eligible to make a reduced QNEC of only 25% of the missed deferral had they provided participants with a special notice describing the error. Since the plan sponsor preferred not to provide that notice, the QNEC must be 50% of the missed deferral. For this step, we apply the plan’s regular matching formula (100% of the first 5% deferred). Note that even though the QNEC from step 2 is only half of the missed deferral amount, we have to use the full missed deferral amount to determine the match correction. Step #5: Deposit the corrective contributions. In this situation, there was no QNEC source setup on the recordkeeping system for the plan. As a result, the plan sponsor had to contact the recordkeeper to establish that source on the system before they could deposit the corrective contribution amounts. The QNEC goes into the newly-created QNEC source, and the corrective match goes into the regular matching contribution source. Depending on the age and/or severity of the failure, it may be eligible for self-correction without IRS approval. The general rule is that as long as an operational failure is caught and corrected within two years, it can be self-corrected. If it has been longer than that, self-correction is still available if the failure is insignificant. In this case, the failure was discovered and corrected less than a year after it occurred. Therefore, the plan sponsor was able to self-correct without any formal filing with the IRS. Based on the above, the percentages are well below the levels the IRS considers significant in its examples, so this failure would be eligible for self-correction regardless of when it was corrected. Bad things happen to good plans. If you've experienced a failure like this, or are combating other issues, DWC is here to help with Plan Correction Services to address any "oops" moments in your plan.